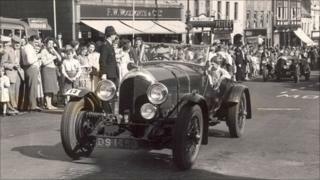 A Bentley which had been in the same Borders family since the 1950s has been sold at auction for £150,000. The 3-litre Speed Model Tourer, built in 1924, went under the hammer at Bonhams collectors' motor cars auction. The Bentley was a "must-have" car of the era having won the famous Le Mans 24-hour race that year. It was bought in 1954 by Eyemouth enthusiast Bill Martin and remained in the family until this month when it was sold to a buyer in England. The car had started its life in Scotland when it was bought, new, from coachbuilders and motor dealers John Croall of Castle Terrace Edinburgh, by a Major Thomson of Ainslie Place in the capital. In 1930 it moved to England where it passed through various hands before crossing the border back into Scotland to Mr Martin. He bought his first 3-litre Bentley for £30 in 1933, raced motorcycles with some success in the 1920s and served as secretary to the Winfield Joint Committee, which ran motor races at the Winfield and Charterhall Circuits in Scotland. The car which has now been sold at auction was a regular sight at these events, being Mr Martin's preferred mode of transport. It was also seen in Bentley Drivers Club events including the Whit Weekend Runs and many other vintage runs in the Scottish Borders, before he passed the car to his enthusiast son in 2001. It still has an up-to-date MOT certificate running to May next year. A Bonhams spokesman said: "Unusually, the car has been in continuous use since it was built. "Bill Martin drove the car regularly and took part in numerous vintage car runs in the Borders over the years. "The Bentley has now found a new home in England."